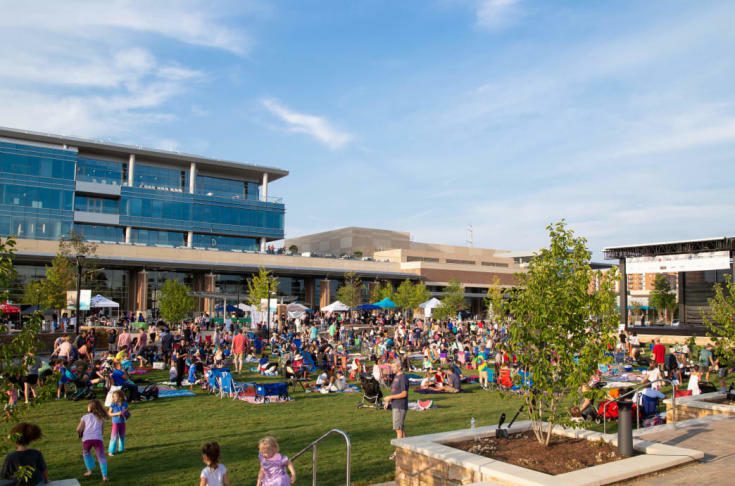 With a brand-new entertainment complex, tons of community events, and loads of outdoor adventures to be had, Sandy Springs is a city where families and kids can make unforgettably fun memories. From paddleboarding to parades, you’ll find a wide variety of ways to enjoy the fresh air and get some exercise. Plus you and the little ones can participate in educational programs that spark the imagination of curious, creative kids, and also engage parents who want to learn something new. To help you plan a day of fun for you and the kids in Sandy Springs, we’ve detailed six great activities that include a mix of nature treks, top-notch entertainment venues, and educational–and fun–events and programs. A twenty-two mile stretch of the Chattahoochee River runs along the northern and western borders of Sandy Springs. The river&apos;s presence in the community offers an easy and convenient way to introduce kids to the great outdoors. At the Island Ford unit of the Chattahoochee River National Recreation Area, you can hop on a moderate 2-mile loop trail where kids can walk along the river looking for birds and other wildlife, traipse across wooden bridges, and duck into rock shelters once used by Native Americans. The Sandy Springs community loves its festivals and events. One of the biggest is the Sandy Springs Festival, a longstanding fall tradition with a pop-up children’s park with rides and inflatables, live music, an artist market, cultural performances, a pet parade, food vendors and more. Other kid-friendly events include the Sandy Springs Lantern Parade in June, and Spooky Springs, a Halloween celebration that emphasizes fun rather than frights. In December, you don’t want to miss the holiday event, Sparkle Sandy Springs, which includes a display of lights and festively painted houses. Traveling themed circuses, musicals based on popular cartoons, dance troupes, and other exciting shows are in rotation at the two performance venues at City Springs, a newly built downtown entertainment hub. There’s also outdoor fun at City Green, a fountain-lined green space where open-air concerts and festivals are often held. One can’t-miss events at City Springs is the Movies by Moonlight series, presented by Leadership Sandy Springs. Held outside on the City Green, the event combines screenings of popular kid-friendly movies with carnival elements like costumed characters, face painting, inflatables, games, and food vendors in its pre-film fun. Programming runs through the fall, and you can check the Facebook page to find out what’s showing and when. Themes rotate monthly at the Sandy Springs location of the Young Chefs Academy: Cooking from scratch, the secrets of seasoning, and holiday meals are just a taste of the classes and workshops available to budding chefs. Be sure to look out for special events where parents can get involved, like the “Mom-and-Me” brunch session or the “Families in the Kitchen” workshop, where all members of the household are invited to participate. Click here for more details on Young Chefs Academy programs. The weekly Heritage Sandy Springs Museum and Park Farmers Market (running April to November) at City Springs makes for a picturesque —and productive—Saturday morning. You can shop for local produce, meats, and more, and then relax at a picnic table with live music as your soundtrack. Once a month there’s an extra layer of fun at Little Diggers, a gardening class that invites kids to play—and learn—in the dirt. Parents are encouraged to join in, and you can take these lessons home so kids can help plant and harvest your own family garden. While Sandy Springs is a bustling metropolitan city, it boasts 950 acres of parkland, giving families ample opportunities to get outdoors to play, exercise, relax, learn, and just enjoy healthy lives. In the Powers Island unit of the Chattahoochee National Recreation Area, you can introduce your kids to hiking on mellow, easily accessible trails and walk with them along the riverbank to try and spy great blue herons and other wildlife. Let the kids loose on the creative, artist-designed playground at Abernathy Greenway Park, or guide them through a landscape of large trees, rock outcrops and streams in the John Ripley Forbes Big Trees Forest Preserve. Or, head to the Lost Corner Preserve, where trails, a greenhouse, community garden, and an apiary have been built around a bungalow-style cottage that sits on farmland dating back to the mid-1800s. Whether your kids love to skip through the woods or pitch in while making family meals, you’ll find plenty of ways to entertain them in Sandy Springs. As the city continues to grow, the community is fostering an environment where families are encouraged to spend time making lasting memories together. With its festivals, parks, and clever programs, this is a great place to be a kid. Written by Jhoni Jackson for RootsRated Media in partnership with Sandy Springs .